Accreditation authorities expect medical schools to increase their teaching standards and civic engagement, despite limited resources. The aim of this study was to investigate the feasibility of community-based (CB) electrocardiography (ECG) instruction in semesters 4 and/or 5 of the undergraduate MBChB programme at the University of the Free State in Bloemfontein, South Africa. A literature review and 34 structured interviews were employed, using a mixed-methods QUAN (+qual) research design. Regarding the preclin-ical phase, 18 interviewees strongly supported community-based learning (CBL) and 21 strongly supported task-based (TB) CBL. Responses were more conservative regarding the practicability of TB CBL. Twenty-two interviewees supported preclinical phase ECG-specific CBL. There was more support for implementing CB ECG in the clinical phase than in the preclinical phase. Challenges identified included finances, transport, personnel availability, clinic space, curriculum time constraints, student and driver absenteeism, and ethical aspects. Solutions for the preclinical phase included combining electrocardiography with other CBL tasks. Many interviewees supported preclinical phase TB CBL, although several factors determine its feasibility. Availability of human and other resources and curriculum time significantly impact CB ECG learning. Solutions necessitate additional location-specific research. Globally social reform objectives influence medical curriculum reform (HPCSA, 2010; McLean, 2004; SAQA, 2013; WFME, 2003, 2012). In 2000, the University of the Free State (UFS) in Bloem-fontein, South Africa, introduced a five-year integrated outcome-based undergraduate medical curriculum, with exit-level outcomes appropriate for training general practitioners (HPCSA, 1999), in accordance with quality assurance policies (UFS, 2006, 2009). Currently (for electrocardiography; ECG) 230 min of classroom teaching and 100 min of practical (Clinical Skills Unit) instruction are included in semester 4 of the five semester preclinical phase. One hour of more advanced practical instruction is subsequently provided by clinicians in the Clinical Skills Unit during semester 5 (UFS, 2015-2016, 2016). The paucity of documented research (from 1995 until the study commenced) regarding early phase community-based (CB) ECG learning in undergraduate medical curricula was possibly due to several other logistically easier and more cost-effective ECG educational strategies that can be employed (Burke, Gnall, Umrudden, Kyaw, & Schick, 2008; Celikkan, Senuzun, Sari, & Sahin, 2013; Jeffries, Woolf, & Linde, 2003; Mahler, Wolcott, Swoboda, Wang, & Arnold, 2011; Raupach et al., 2010; Romanov & Kuusi, 2009; Rubinstein, Dhoble & Ferenchock, 2009; Smith, Prybylo, & Conner-Kerr, 2012). The principal aim of this study was to improve preclinical phase ECG training in the UFS undergraduate medical curriculum, in order to improve patient outcomes and promote more cost-effective patient care (Crawford & Doherty, 2010; Jevon, 2010). A secondary aim was to categorise key factors that impact early phase CB ECG learning, to provide a checklist that may streamline decision-making at medical schools (locally and abroad) in this regard. Work-integrated learning (WIL) has multiple, diverse benefits for students' development (CHE, 2011). However, a distinction between the preclinical (basic sciences) and clinical phases of traditional curricula often results in late exposure of students to patients (McLean, 2004). Effective CBE requires outcome-appropriate educational strategies, such as those included in the SPICES model (Harden, 2007; Harden, Sowden, & Dunn, 1984; Karim, Abdulghani, & Irfan, 2011), that address priority community issues (HPCSA, 2011; Magzoub & Schmidt, 2000). Harden identified greater theory-practice integration and the development of a "reflective practitioner" as advantages of undergraduate task-based learning (TBL) (Parry, 1989), but initially less emphasis was placed on TBL in the earlier phases of undergraduate medical curricula (Harden, Laidlaw, Ker, & Mitchell, 1996; Ozkan et al., 2006; Virjo, Holmberg-Marttila, & Mattila, 2001). 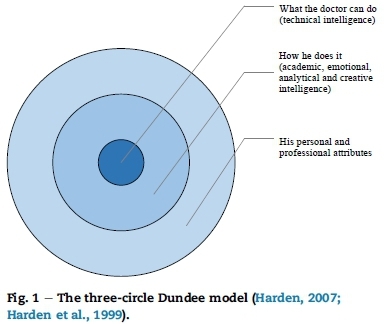 The educational three-circle Dundee model (Harden, 2007; Harden, Crosby, Davis, & Friedman, 1999)(Fig. 1) indicates that progress in learning occurs by an increase in the breadth of mastery, depth or complexity of learning, knowledge application (in various contexts), and proficiency. Electrocardiog-raphy, as procedure, corresponds with the inner circle and electrocardiogram interpretation corresponds with the middle and outer circles of the Dundee model. However, optimally presented CB ECG learning also includes aspects of the outer circle (such as self-confidence, time management and initiative) which significantly increases the educational value thereof. 1. To identify the key challenges that influence the feasibility of introducing CB tasks in the preclinical phase of a South African undergraduate MBChB curriculum. b. personnel teaching cardiovascular system-related content or involved in UFS undergraduate curriculum community-based learning (CBL). The theoretical basis for the research (based on a comprehensive literature review, to formulate appropriate interview questions) was qualitative. 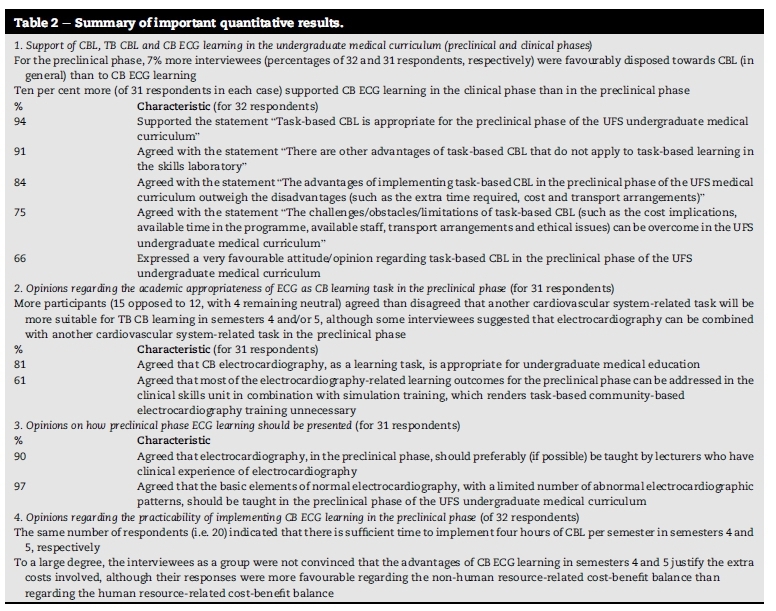 A mixed-methods design (qualitative data embedded in a larger amount of quantitative data) was applied, to clarify and contextualize the quantitative data (Creswell & Plano Clark, 2011) and prioritize key challenges regarding CB ECG learning in the preclinical phase of the UFS undergraduate MBChB curriculum. The literature review and collection of qualitative data were used to address the first research question. The second research question was mainly addressed by collecting quantitative data (and subsequently integrating the quantitative and qualitative results). The researcher mainly applied a positivist (objective and deductive) approach with some elements of the interpretivist approach (UWE, 2007:Online). The point of interface, where the qualitative and quantitative strands were mixed, occurred at the level of research design and during data collection and data interpretation (Creswell & Plano Clark, 2011). Audio-recorded structured interviews were conducted with a purposive sample of 34 (91.9%) of 37 eligible respondents (based on one essential and at least one additional inclusion criterion) (Table 1). Ethical approval for the research was obtained from the Faculty of Health Sciences Ethics Committee (ECUFS no. 218/ 2012), the Dean of the Faculty of Health Sciences, the Vice-Rector: Academic of the UFS and the Head of the School of Medicine. A fixed one-phase mixed methods design (in which quantitative and qualitative data were concurrently collected in a predetermined way) was used (Creswell & Plano Clark, 2011). An invitation letter, the interview questionnaire, and consent form were electronically mailed and personally delivered to each potential interviewee in advance. Interviewees could therefore provide carefully considered responses (graded on a Likert scale) to closed ended questions (which represented the quantitative data) during the interview, prior to their comments and responses to open ended questions (which represented the qualitative data). The researcher contacted non-respondents within ten days of delivery, to optimise the response rate. The interview questionnaire was provided in English or Afrikaans, since all recipients were English- or Afrikaans-proficient (UFS, 2003), but recipients could request the documentation in another language, if preferred. Written informed consent was obtained prior to each interview. The researcher conducted all the interviews, during which the quantitative data questions directly preceded the related qualitative data questions. The researcher ticked the quantitative data boxes on a hard copy of the interview questionnaire and made some explanatory and observational notes to complement the recorded qualitative data. The researcher transcribed the qualitative data by listening to the audio-recordings. The data from two pilot interviews were included in the main study, since no methodological changes were effected after these interviews. Quality control regarding data capturing was performed before data analysis commenced. 6. comparing the qualitative and quantitative results in each category. During data interpretation, the quantitative and qualitative results were integrated to try and answer the two (equally important) research questions more comprehensively and contextually. Two pilot interviews improved the reliability of the quantitative data collected. Internal validity was addressed by the biostatistician, researcher and principal supervisor checking the quantitative data. A comprehensive literature study (to formulate appropriate interview questions) was performed to ensure external validity (i.e. applicability/repeatability in similar contexts) (Bryman, 2012). Interpretive rigour (Dellinger & Leech, 2007) regarding the qualitative results was promoted by the verification of interview transcript content by the principal supervisor and particular interviewee (to minimise researcher bias) and the use of direct interviewee quotations and translations of non-English quotations (to optimise data categorisation). The use of well-defined eligibility criteria and audio-recordings promoted research trustworthiness (reflecting noteworthy results, as described by Babbie & Mouton, 2012). During data collection, ethical practices (concerning location, communication and confidentiality) were applied. Regarding the confidentiality of responses, a number coding system was used (to replace personal identifiers on the data sheets) and the interview transcripts were stored in a locked cabinet. The qualitative electronic data could only be accessed by the researcher and the two supervisors. The quantitative data were used to objectively evaluate (in terms of frequencies and percentages) the feasibility aspect of the study: participants' responses regarding the various sub-categories of interview questions were compared. Only the most important quantitative results are reported in this article. Three interviewees did not answer the interview questions that specifically pertained to electrocardiography-related or community-based learning because they had no previous experience thereof. They did, however, provide valuable qualitative information regarding the instructional and logistical aspects of the undergraduate UFS curriculum. Of 32 interviewees, 18 (56.2%) strongly supported community-based learning (CBL) in general, and 21 (65.6%) strongly supported task-based (TB) CBL, for the preclinical phase. Responses were more conservative regarding the practicability of TB CBL. For the preclinical phase, 7.2% more interviewees (n = 25 of 32 respondents; 78.1%) expressed a favourable opinion regarding community-based learning (CBL) in general, as opposed to ECG-specific CBL (n = 22 of 31 respondents; 70.9%) (Fig. 2). Other notable quantitative findings appear in Table 2. The qualitative data deepened the researcher's understanding concerning the complexity and prioritization of the key feasibility factors. Prominent UFS challenges include transport, finances, the ethical aspects, availability of personnel, curriculum time constraints, student and driver absenteeism, and available clinic space. Possible solutions for these challenges include sound planning, appropriate policies, the necessary administrative and political will for resource allocation, the filling of all available posts, the motivation of stakeholders, nearer locations, the use of smaller student rotational groups, bus transport and student log books. Potential advantages of TB CBL include: (i) student-related advantages: consolidation of theoretical knowledge, contextual application of knowledge, development of interpersonal-, time management- and problem-solving skills, communication and teamwork, and student motivation; and (ii) community-related advantages (as opposed to TB learning in the skills laboratory): potentially cost-effective ECG screening and improved community perceptions regarding access to ECG screening. Student-, curriculum- (e.g. time), resource- (e.g. venue and staff) and task-related factors impact the feasibility of TB CBL in the UFS preclinical phase (Table 3). The most prominent resource-related prerequisites for UFS preclinical and clinical phase CB ECG learning are the availability of ECG machines and supervisors who can refer patients for further management. Resource-related challenges: finances, the availability of a competent clinical supervisor to assist with patient management, space at the learning sites, functional equipment and ECG consumables, and student transportation and overnight accommodation at distant locations. Curriculum-related challenges: appropriate strategic planning, implementation guidelines, learning outcomes, presentation of the learning content (constructive alignment, chronology and time allocation) and patient selection. Personnel-related challenges: e.g. the co-operation of clinic personnel and obtaining a "motivating" champion. These include a trial implementation period with analysis of the time required, a structured approach, clearly formulated learning outcomes, one CB six-hour practical session, electronic submission of ECG recordings for quality control of ECG interpretation and linking clinical phase CB ECG learning to existing community-based rotations. - quality assurance regarding the practical registration of ECGs: standardisation etc. - the four types of cardiac arrest. Application of the mixed methods research design clarified the reasons for participants' concerns and recommendations regarding the feasibility and sustainability of preclinical phase CB ECG learning. Responses regarding CBL, TB CBL and CB ECG learning at the UFS were generally favourable. Effective CBL and pre-clinical phase TB CBL require the initial formulation of appropriate learning outcomes (that are aligned with well-defined tasks) and optimal time utilisation. Most interviewees supported preclinical phase CBL and CB ECG learning, if the associated resource related challenges could be addressed, but most interviewees preferred a non- ECG cardiovascular system-related task for preclinical phase TB CBL. Positive factors impacting the benefit-cost ratio of CB ECG learning included the fact that CBL is an HPCSA accreditation requirement, the earlier exposure of students to authentic contexts, greater student awareness of the value of electro-cardiography and that ECG can be combined with other CBL tasks. Negative factors included the concern that "controlled" situations are difficult to achieve in the community, the formulation of appropriate "community-based" learning outcomes may be complex, the ongoing personnel constraints and the lack of ECG machines in some venues. Useful data were collected due to the diversity of interviewee occupational roles. The categorisation of the key impact factors may be useful for curricular development (by streamlining decisions regarding CBL during the early phases of medical curricula) at other South African medical schools and abroad. The UFS undergraduate medical curriculum currently differs from other South African medical curricula (regarding duration and the arrangement of content): this may limit direct application of some of the solutions identified. At the time of the study, there were few documented results of similar South African-based studies with which the research findings could be compared, and time and budgetary constraints limited the context to the UFS. The feasibility factors regarding a particular CBL task should be evaluated in the light of the context-specific accredited exit level outcomes and relevant pedagogical models. Categorisation of these factors (Table 3) can direct decisions and future research so that the most difficult issues are addressed first, in the most cost- and time-effective way. The perspectives of all stakeholders should be investigated and Faculty should collaborate with the community to align the learning tasks to the capacity of the available community personnel and appropriate standards of patient care. Clear guidelines for ethical conduct of all stakeholders should be formulated. Appropriate policies, sound planning, the necessary administrative and political will for resource allocation, the filling of all available personnel posts, nearer locations, the motivation of all stakeholders, well-defined learning tasks (with appropriate learning outcomes at the applicable level), the use of student log books, smaller rotational groups, and reliable bus transport should increase the feasibility of including TB (including ECG) CBL in the UFS undergraduate medical curriculum. A variety of CBL locations should be investigated, due to the limitations in space at local clinics. Since 30 of 32 respondents (93.8%) supported the use of preclinical phase TB CBL, a short-term trial investigating the use of a CB cardiovascular system-related task during semester 4 or 5 is justified. The possibility that students in the preclinical phase maybe able to share logistical resources with more senior students should be investigated. Four hours of CBL in semesters 4 and 5 will require strategic planning, but a combination of related tasks will increase the practicability thereof. Most participants preferred a non-ECG cardiovascular system-related task for preclinical phase TB CBL. More interviewees supported clinical phase as opposed to preclinical phase CB ECG learning, which can be ascribed to the complexity of ECG interpretation and subsequent patient management. - adherence to appropriate ethical standards. - refinement of Faculty policies for ethical conduct. The identification and formulation of appropriate learning outcomes (based on the exit level outcomes and constructively aligned and integrated with other curricular content) will enhance the feasibility of undergraduate CB ECG learning and assist with the optimal implementation thereof. Consideration of the most important impact factors identified (Table 3) can assist other medical schools to assess the feasibility of TB CBL in their undergraduate curricula. C.O.L. identified the research topic, formulated the research aims and objectives and contributed to the conception and design of the work; conducted and transcribed all the individual interviews and was responsible for the initial coding, analysis and interpretation of data; drafted the initial research documentation; and approved the final version of the article. J.B. contributed to the design of the research and the analysis, interpretation and verification of data; critically reviewed the draft of the article and approved the final version. L.J.vdM. contributed to the analysis and interpretation of the data and critical assessment of the content of the article and approved the final version. Professor Gina Joubert, Department of Biostatistics, UFS, for assistance with the methodology and analysis of the quantitative data; Dr. Daleen Struwig for technical and editorial preparation of the article submitted for publication; and the UFS and Health and Wellness SETA of South Africa (HWSETA) for funding. * Corresponding author. Department of Basic Medical Sciences (G25), Faculty of Health Sciences, University of the Free State, PO Box 339, Bloemfontein, 9300, South Africa. Fax: þ27 51 4019134. E-mail address: gnfscol@ufs.ac.za (C.O. Larson).